I am passionate about music, film, writing scripts and stories, wine, women, singing and dancing - but not necessarily in that order. With ProWein 2015 opening in Düsseldorf on the Ides of March I have been reflecting on South Africa’s wine heritage. With the Dutch arriving at the Cape on 6 April 1652 the South African wine industry started on 2 February 1659 when Jan van Riebeeck, first Governor of the Cape, wrote in his journal “Today, praise be to God, wine was pressed for the first time from Cape Grapes.” Evidently the vines must have come from somewhere else. In 1654 the Dutch East India Company (VOC) sent Van Riebeeck vine cuttings from Rheingau, Germany. These vines didn’t propagate since the damp sail cloth damaged their root system. During 1655 more cuttings arrived from Bohemia, the Canary Islands, France, Germany and Spain. Muscat Blanc à Petits Grains from France were successful; including Muscat d’Alexandrie, known locally as Hanepoot. The famous dessert wine, Grand Constance served to the French Emperor Napoleon Bonaparte at St Helena Island and other royalty such as King Louis Philippe of France and Frederick the Great of Prussia, was crafted from Muscat Blanc à Petits Grains at Groot Constantia. This 750 ha estate (a grant 15 times larger than the VOC’s provision) was secured by Simon van der Stel, the Cape’s second Governor in 1685. It was later subdivided into three units. This year heralds 330 years of uninterrupted winemaking on the estate. Since my arrival in the Cape I’ve spent many memorable hours on the estate marketing the wines to our client in Belgium, amongst others. On one such occasion Anne-Sophie and I were driving back to town when she tells me, “I’m surprised that you asked Boela so many questions. You don’t know it? The winemaking process seems quite essential to me.” That remark put me on the road towards my studies at the Cape Wine Academy. Here is a more recent encounter of the South African wine history. Our family is really passionate about wine. With me being in the wine trade I pride myself in keeping everyone up to date. And of course whenever I fly up to Johannesburg to visit, it is taken for granted that I take along a case of wines. And wanting to impress them I carefully choose a case of mostly red wines with vintages dating back 7 to 10 years. But on this occasion Pierre discovered several old vintage wines when packing their household goods. He decided to serve these at a lamb spit braai the day before he and his family flew home. Two prized possessions were a Chateau Libertas Superior 1980 1.5L magnum and a Simonsvlei Pinotage Superior 1985 1.5L magnum. And not just for being so old. These were given to him by my dad when he received his BSc and Honours degrees. Chateau Libertas was launched in 1932 and is the creation of Dr William Charles Winshaw, the founder of Stellenbosch Farmers Wineries. It is a Cabernet-based blend, wood-matured and designed for immediate enjoyment but with sufficient maturation potential for many years to come. Pierre enjoys sharing and as his custom he invited 20 plus family members to join him to commemorate these occasions plus my dad’s passing away in 2010. I was not there as I flew back to Cape Town the week before. 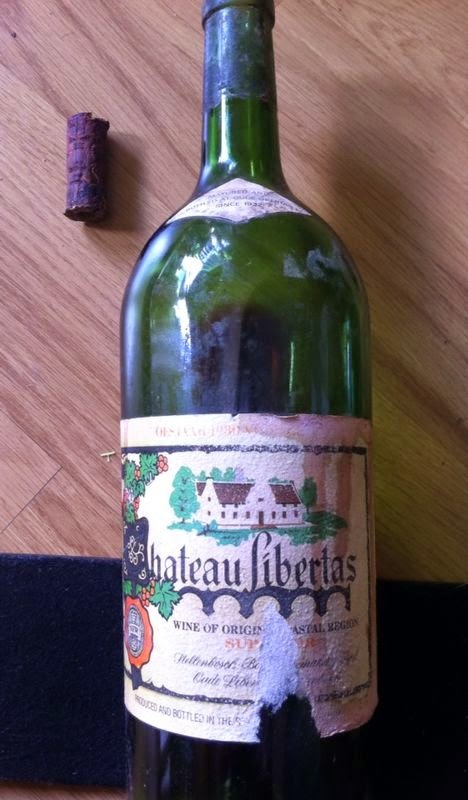 Pierre told me afterwards that although some wine leaked out, the Chateau Libertas 1980 tasted absolutely superb, like velvet with black fruits on the nose and palate. 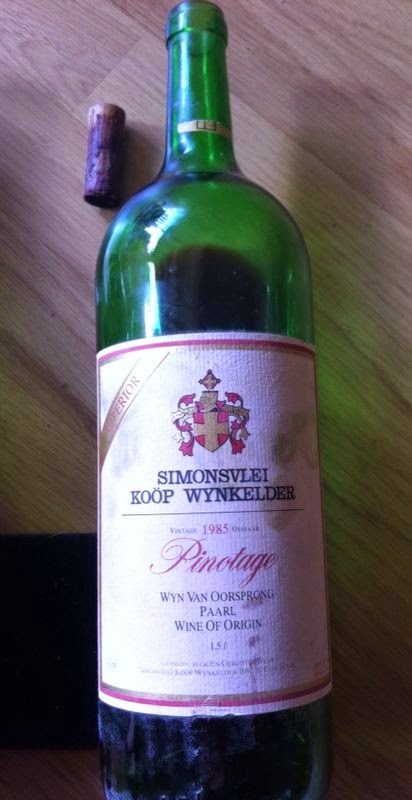 The Simonsvlei Pinotage 1985 was smooth with plums on the nose and berries on the palate. To track back one generation, Pinotage was created at Stellenbosch University in 1925 by Prof. Abraham Izak Perold, the first Professor of Viticuture. Perold was attempting to combine the best qualities of the robust Hermitage with Pinot Noir, planting four seeds from the cross in the garden of his official residence. In 1927 he left the university, forgetting about the seedlings. When a team came in to tidy up, Charlie Niehaus a lecturer who knew about the seedlings, happened to pass by and rescued the young plants. Prof. CJ Theron at Elsenburg Agricultural College, Prof. Perold’s successor, grafted them in 1935 onto Richter 99 and Richter 57 rootstock. The best one was selected for propagation and christened Pinotage. During 1941 the first Pinotage wine was made at Elsenburg. Planting Pinotage since 1953, Bellevue Estate won the champion trophy at the 1959 Cape Wine Show; while Lanzerac Wine Estate was the first to commercialise Pinotage in 1961 with a 1959 Pinotage. South Africa has 356 years experience of producing excellent wines and this is ample proof that our red wines can age 30 to 35 years with grace. Let us make you a part of this success story. References: Cape Wine Academy, Groot Constantia Estate, Distell Ltd, Platter’s 2015 South African Wine Guide, Simonsvlei International, WikipediA, WOSA (Wines of South Africa).